A genetic profile is created by measuring scientifically established points in a Y-Chromosome test. This type of genetic profile is known as a Haplotype. 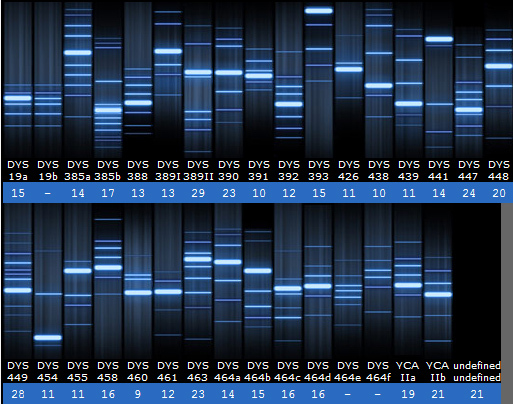 The numbers that makeup the haplotype consist of values measured at specific locations along the chromosomal DNA. The numeric value is always unique to your DNA, and the combination of the different values makes up the unique numbers of your haplotype. Comparing haplotypes is a way to find genetic cousins. It does not uniquely identify you as an individual, but the genetic location markers can confirm the existence of a common male ancestor between two individuals. MRCA stands for Most Recent Common Ancestor and gives you an idea of how many generations in the past you shared an ancestor. MRCA calculations are based on the number of markers tested, the number of matching values, and the mutation rate of the markers. The following genetic profile is that of the grandson of Thomas George Leslie Molineux, born in 1946 to Thomas's eldest son.